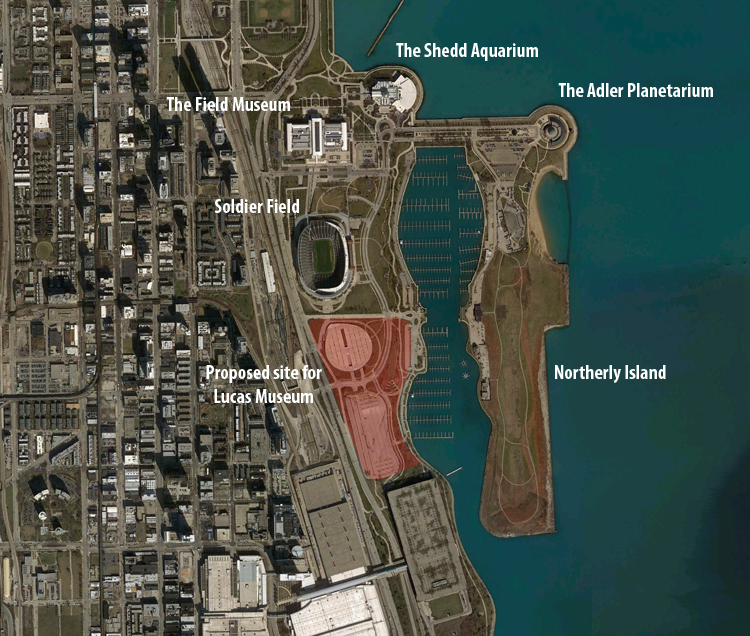 The proposed site for the Lucas Museum of Narrative Art would replace two parking lots south of Soldier Field. George Lucas, the filmmaker famous for the Star Wars franchise, can’t seem to catch a break. First, his bid to build a museum to house his vast populist art collection, along with memorabilia from his films, on Crissy Field in San Francisco’s Presidio fell through when the Presidio Trust “decided not to pursue any of the proposals to build a cultural institution.” The $700 million Beaux-Arts-inspired proposal, designed by the Urban Design Group of Dallas and the Office of Cheryl Barton of San Francisco, had received plenty of negative and positive criticism, and Lucas had vowed to take the museum to another city, such as Chicago, if rejected. In June, it was announced that Lucas had indeed made good on that threat, and Chicago had successfully lured Lucas to its shores. Chicago’s mayor, Rahm Emanuel, offered the current site, two parking lots covering roughly 17 acres, along the lakefront of Chicago for a yearly lease of one dollar, an offer too good to resist. Like the Presidio, the site could give visitors great access to waterfront cultural sites, along with stretches of green space, but it also offers the reflected glamour of being nestled among such world-class museums as the Field Museum, the Adler Planetarium, and the Shedd Aquarium—an area known as the Museum Campus.